Iguanas are a genus of lizards that are native to the tropical areas of the Americas and the Caribbean. 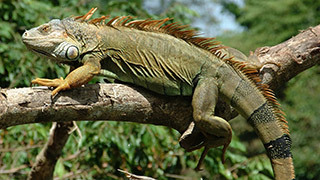 There are two described species of this reptile, the most common is the green iguana, which is widespread and also a popular pet. Besides that, there's the Lesser Antillean iguana which is an endangered animal and only living on the Lesser Antilles islands.